This article will detail how track groups can be used and created. 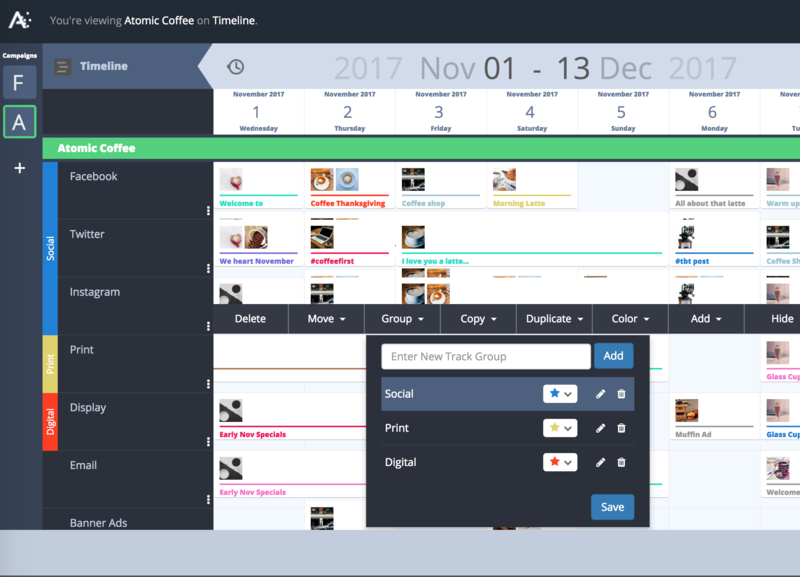 Track Groups allow for Owners and Collaborators to create a second-level grouping of content, by grouping individual Timeline tracks together using a higher-level relationship. Whether something as simple as 'Social' to group your social channels, or something more complex like organizing your enterprise teams, Track Groups improve the visibility and management of your content by helping show the relationship between different parts of your campaign data. To create and assign a track group, simply open the Track Menu for any track, and click 'Group Track'. A menu will be displayed allowing for the creation of a new track group, or the selection of an existing track group. Track Group colors and names can also be edited in this menu. Once assigned a Track Group, the track will be displayed next to all other Tracks with the same group assignment, and the track group name will be displayed vertically on the left side of the grouped tracks.